Zimbabwe's often violent land reform programme has not been the complete economic disaster widely portrayed, a new study has found. 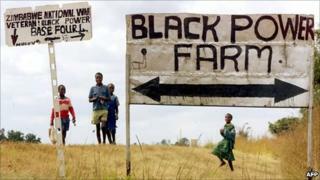 Most of the country's 4,000 white farmers - then the backbone of the country's agricultural economy - were forced from their land, which was handed over to about a million black Zimbabweans. The study's lead author, Ian Scoones from the UK's Institute of Development Studies at Sussex University, told BBC News he was "genuinely surprised" to see how much activity was happening on the farms visited during the 10-year study. "People were getting on with things in difficult circumstances and doing remarkably well," he said. He declines, however, to characterise it as a success. The policy was central to President Robert Mugabe's re-election campaigns in 2002 and 2008, as he argued that he was putting right the wrongs inherited from the pre-1980 colonial era, when black Zimbabweans were forced from their homelands in favour of white settlers. But his numerous critics accused him of simply bribing voters, while destroying what used to be one of Africa's most developed economies. "What we have observed on the ground does not represent the political and media stereotypes of abject failure; but nor indeed are we observing universal, roaring success," says the study - Zimbabwe's Land Reform, Myths and Realities. Mr Scoones accepts that there were major problems with the "fast-track" land reform programme carried out since 2000, such as the violence, which included deadly attacks on white farmers and those accused of supporting the opposition, and the corruption associated with the allocation of some farms. The study also notes that most beneficiaries complained about the government not giving them the support they need, such as seeds, fertiliser and ploughing the land. But he says much of the debate has been unduly politicised. "We wanted to uncover the facts on the ground," he said. That most of the land has gone to political "cronies"
That the rural economy has collapsed. The study found that about two-thirds of people who were given land in Masvingo were "ordinary" - low-income - Zimbabweans. These are the people Mr Mugabe always said his reforms were designed to help. The remaining one-third includes civil servants (16.5%), former workers on white-owned farms (6.7%), business people (4.8%) and members of the security services (3.7%). Of these, he estimates that around 5% are "linked to the political-military-security elite". In other words, that they were given the land because of their political connections, rather than their economic need, or agricultural skills. Mr Scoones accepts that the proportion of such "cronies" being given land may be higher in other parts of Zimbabwe, especially in the fertile areas around the capital Harare, and that 5% of people may have gained more than 5% of the land even in Masvingo. But he maintains that they gained a relatively small proportion of the overall land seized across the country. The researchers found that, on average, each household had invested more than $2,000 (£1,200) on their land since they had settled on it - clearing land, building houses and digging wells. This investment has led to knock-on activity in the surrounding areas, boosting the rural economy and providing further employment. One of those questioned, identified only as JM, told the researchers that before being given land he had relied on help from others but now owns five head of cattle and employs two workers. "The new land has transformed our lives," he said. Others say they are much better off farming than when they had jobs. He says that about half of those surveyed are doing well, reaping good harvests and reinvesting the profits. Maize is Zimbabwe's main food crop but its production remains reliant on good rains and output remains well below that pre-2000. Mr Scoones says Zimbabwe's food crisis of 2007-8 cannot be put down to the land seizures, as those people who went hungry produced a large surplus both the previous and subsequent years. Before the "fast-track" land reform began in 2000, tobacco, mostly grown by white commercial farmers, was Zimbabwe's biggest cash crop. But producing top quality tobacco requires considerable investment and know-how, both of which are lacking among many of the new black farmers. Instead, they often grow cotton, which has now replaced tobacco as the main agricultural export. Mr Scoones says those who are struggling the most are the least well-off civil servants, such as teachers and nurses, who have been unable to get credit and do not have the resources, or political connections, to invest in their land. He hopes that as Zimbabwe's economy slowly recovers under a power-sharing government, a new programme can be worked out which would give these people the backing they need to succeed. It is often argued that large-scale commercial farming - as many of the white Zimbabweans used to practise - is inherently more efficient than the smallholder system which replaced it, but Mr Scoones dismisses this argument and says he is backed by several studies from around the world. He says it is now impossible to return to the previous set-up and even suggests that some of the evicted white farmers may one day work with the new farmers as consultants, marketing men, farm managers or elsewhere in the overall agricultural economy, such as transporting goods to market or helping to transform and add value to their produce. Many of those who remain bitter about losing their land may are likely to respond: "Over my dead body". But Mr Scoones says a surprising number are already taking this option and making reasonable money from it "under the radar".